Brio Promotions sells promotional products that they imprint with a client's logo, including such items as apparel, coffee mugs, pens and more. The items are commonly used as giveaways at trade shows, but can also be sent to customers in mailings and given as corporate gifts. The promotional product niche is extremely competitive. There are literally thousands of companies selling promotional items. The challenge Brio Promotions faced was in differentiating itself from other providers. 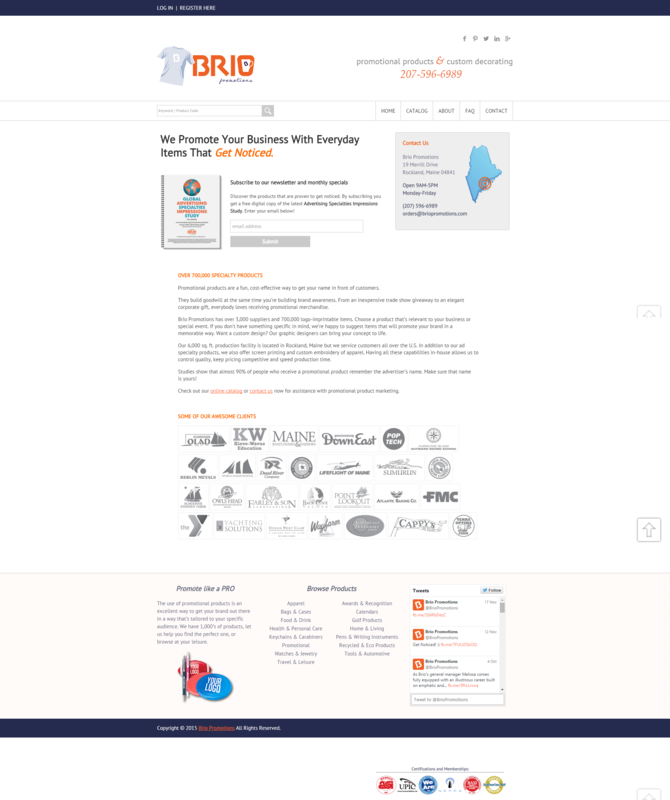 The company needed a website that set Brio apart. Susan Greene wrote website copy that emphasized the high level of service Brio Promotions provides to its clients. Unlike many other companies in this space, Brio is much more than an order-taker. It specializes in doing research to find unique items that are clever and memorable and will help build a client’s brand recognition. It also does custom design work for its imprints. Additionally, the breadth of Brio Promotions’ product lines goes far deeper than any of its competitors. It has over 700,000 logo-imprintable items and has a 6,000 sq. ft. production facility. By providing these facts in an interesting way, Susan was able to convey what makes Brio Promotions an industry leader. Ever since the launch of its website, Brio Promotions has been growing rapidly. In fact, the company is currently running multiple ads to hire additional staff. Love the new copy you created for our website! It's been a pleasure working with you, and I'm sure there will be more work to come in the near future. Does your website help your business stand out in a crowded field? If not, we should talk.